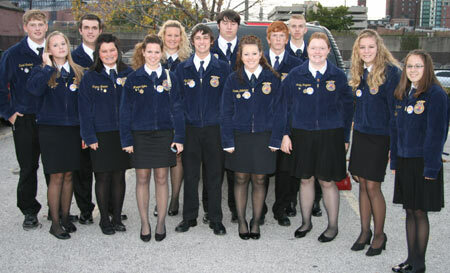 On March 30, 2010, the Chillicothe FFA Chapter participated in the Northwest District FFA Contest. The results are as follows: Agricultural Issues, 2nd place (state) - Alexis Sykes, Marc Griffith, Emily Sallee, Aaron Kerr, Amber Kieffer, Clayton Allen, Kellin Ferguson; Parliamentary Procedure, 1st place (state) -Lynzie Colvin, Travis Henry, Kelsey Jones, Hope Peters, Mindi Prindle, Michaela Simmer, Jennifer Waits (Alt); Prepared Public Speaking Division I – 1st place (state) – Caela Ashford; Knowledge Team 14th place - Trevor Long, Kaitlyn Garr, Jordan Huddleston, Madi Condron, Lizzy McCoy (Alt). 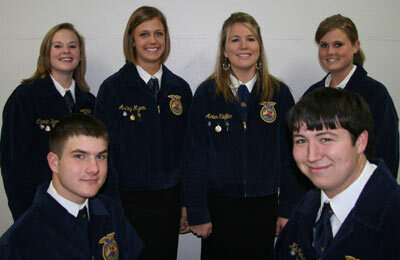 All members advancing to at the State FFA contest, it will be held in Columbia on April 15 & 16. 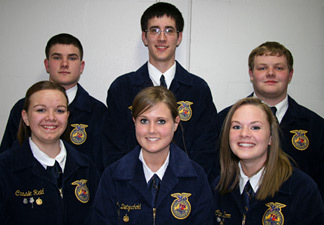 On March 30 and April 1, 2010 the Chillicothe FFA Chapter participated in the Northwest District Ag Contest. The results are as follows: Agriculture Mechanics 5th place (state)- Austin Cassity, Jacob Ballard, Austin Ireland, Cody Thompson; Agriculture Sales 2nd place (state)- Aaron Kerr (second high individual), Emily Sallee, Tyler Skipper, Kellin Ferguson (third high individual); Agronomy 23rd place -Ariel Bruce, Connor Cox, Magen Rector; Dairy Foods 12th place -Taylor Daily (Alt), Derek Gray, Bridgett Kieffer, Jake McKiddy, Hannah Thomas; Dairy Cattle 8th place (state) -Cheyenne Bannan, Marie McMahan, Ashely Myers, Sydeny Oden(fourth high individual); Entomology 20th place-Hunter Brown, Thomas Painter, Dylan Proctor, Vanessa Wheelbarger; Farm Management 1st place (state) -Jon Black (first high individual), Amber Kieffer, Zach Thompson (second high individual); Floriculture 24th place-Kole Anderson, Michael Rounkles, Maresa Sykes, Haley Thompson; Forestry 9th place-Dani Moore, Mason Moore, Lara Hopper (Alt), Clark Allen, Cherokee Lawson; Horses 13th place-Kendra Ballantyne, Carrie Boon, Chelsea Mann, Morgan Hughes; Livestock 2nd place (state)- John Davis (fifth high individual), Lauren Dietzschold, Maycee Hoover, Cassie Reid (sixth high individual); Meats 13th place -Kelton Diggs, Matt Goll, Stoney Paustain, Brooklyn Reed, Hannah Meyers (Alt); Nursery/Landscape 11th place - Matt Denton, Jordan Hall, Nick Koenig, Trent Putnam; Poultry 18th place-Tanner Jones, Cyrsten Lollar, Leslee Moore, Olivia Hayes; Soils 13th place-Daniel Nowland, John Rooney, Justin Haddakin, Kayla McCollough, Zac Merrill (Alt). 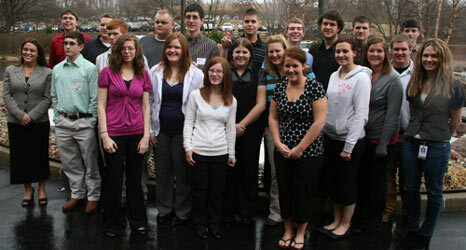 The teams that qualified will be participating at state contest on April 16th and 17th, in Columbia, Missouri. The Chillicothe FFA fielded 18 teams and 1 speaker at District Agriculture and FFA Career Development Events on March 30st and April 1st. A total of 80 students competed from the Chillicothe FFA. 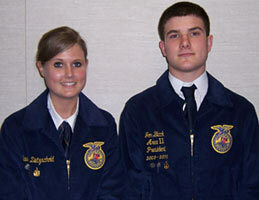 Local FFA members brought home seven 10th place or higher honors. Chillicothe FFA qualified seven teams and one speaker for State FFA Convention. The convention is to be held on the campus of the University of Missouri on April 15 & 16, 2010 in Columbia, Missouri. The local chapter is part of the Agricultural Education Program at the Grand River Technical School and is composed of students from Bosworth, Chillicothe, and Southwest high schools. 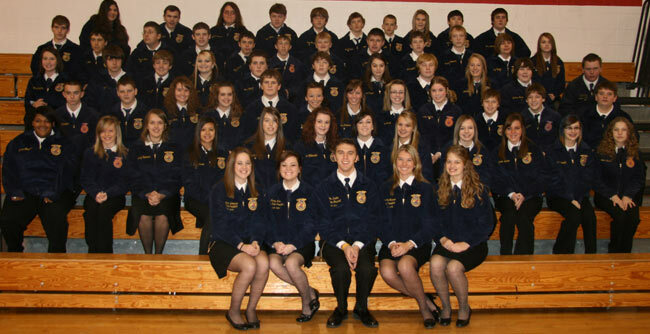 On Friday, March 26, 2010, 55 members of the Chillicothe FFA Chapter attended a practice contest on the North Central Missouri College campus. This practice contest served two purposes for the chapter; one was to help students prepare for district competition and the other was to fulfill the requirement of a TSA Event. The Carl D. Perkins Career and Technical Education Act requires that secondary and postsecondary Career Education students completing a program of study will be assessed for Technical Skill Attainment (TSA). The Division of Career Education recognizes that the implementation of Carl D. Perkins Career and Technical Improvement Act of 2006 (Perkins IV) brings new challenges. History tells us that with any new legislation there are many questions and unforeseen circumstances that will require additional guidance. The Division is committed to providing good customer service and working with all Local Educational Agencies (LEA) to assist with the program transitions called for in Perkins IV. Perkins IV requires 2S1 Technical Skill Assessment (TSA) to measure the percentage of Career and Technical Education (CTE) concentrators who pass a skill assessment aligned with industry-recognized standards, if available and appropriate. Previously, with Perkins III, it was not specified how assessments were to be given. LEAs used a variety of methods to assess technical skill attainment including grade point average and locally developed assessments. Perkins IV outlines more specific requirements and guidelines in the type of assessment used to measure CTE skill proficiency. The Chillicothe FFA Chapter has also sent 27 students to Lathrop, MO and 8 students to Savannah, MO for participation in TSA events. Overall 90 agriculture students from the Grand River Technical School have participated in events that test their technical skills in an ag related area as a part of a requirement set forth by the Perkins Act which is a federal funding act. 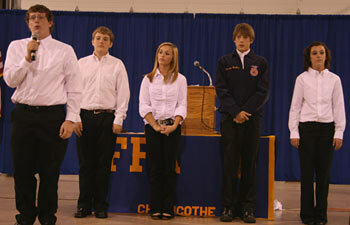 On March 24, 2010, the Chillicothe FFA Chapter participated in the Area II FFA Contest. The speaking results are: Creed Speaker: Carley Anderson –silver; Prepared Public Speaking Division I Speaker: Caela Ashford – 2nd and gold; Prepared Public Speaking Division II Speakers: Marshelle Johnston – silver, Caitlin Cramer - silver; Advanced Prepared Public Speaking: Aaron Kerr – 4th and gold; Extemporaneous Speaking: Cassie Reid – 4th gold. FFA books Completed Ownership: Clark Allen - gold; Completed Placement: Nick Koenig-silver; Beginning Ownership: Hannah Thomas - gold; Beginning Placement: Dallas Boyd - silver; Scrapbook: Devinn Ashford, Quincy BeVelle, Caitlin Cramer, Kelsey Jones, Dani Moore, Daniel Nowland, Hope Peters, Mindi Prindle, Maresa Sykes, and Haley Thompson – 2nd and gold. Parliamentary Procedure team: Lynzie Colvin, Travis Henry, Kelsey Jones, Hope Peters, Mindi Prindle, Michaela Simmer, Jennifer Waits (Alt) - 1st place and a gold. Those teams and individuals receiving 3rd place or higher will proceed to District competition March 30, 2010. 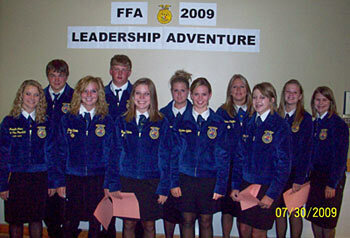 On March 12, 2010, senior FFA members participated in a Senior FFA Trip. Students that had received a participation medal every year while in FFA were eligible to attend the trip. Students traveled to St. Louis for this trip. Sites they got to see were the Monsanto Corporation, Bush Stadium, Union Station, and dining at Riggari's. While at Monsanto, students received a tour of the greenhouses, attended an informational session on what Monsanto does for agriculture, and got to speak with Livingston County natives that now work for Monsanto, Brenda (Jones) Crockrell, Laura Schottel, and Paul Ratliff. Students received a tour of Bush Stadium as well as and informational session regarding the maintenance of the turf at Bush Stadium. Students are pictured outside the Monsanto Corporation. 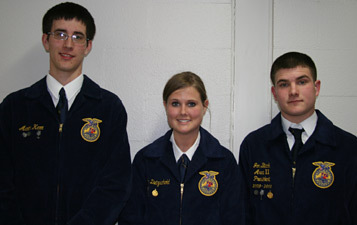 On March 10, 2010, the Chillicothe FFA Chapter sent two representatives to the Area II officer and state candidate interviews. Lauren Dietzschold, daughter of Keith and Linda Dietzschold, was Chillicothe’s representative for an Area II officer. Lauren was selected as the Area II FFA President. 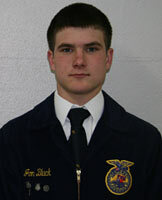 Jon Black, son of Rusty and Karie Black, was Chillicothe’s representative for Area II State Officer Candidate. Jon was selected as the Area II State Officer. 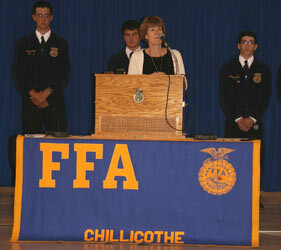 On March 3, 2010, the Chillicothe FFA Chapter held their local speaking contest. The local speaking contest was held in order to determine who the chapter will send to the Area 2 FFA Contest. Area contest will be held on March 24, 2009 in Gallatin. Also, we selected the Chillicothe candidates to send to Area and State Officer Interviews. Results are listed below. On February 2, 2010 the Chillicothe FFA Chapter held their annual January/February meeting in cooperation with the Chillicothe High School Hunting and Fishing Club. 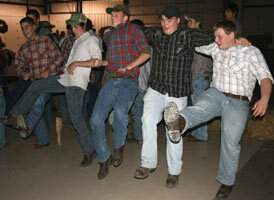 This year students enjoyed a bon fire, hot dog roast, food, hayride, and two programs. Kyle Hibner put on the program about taxidermy. He talked about proper steps to be able to take an animal to the taxidermist as well as what a taxidermist’s job is. Also, Shawn Whitson put on a program regarding the Swan Lake Conservation Area. The meeting was held at the Litton Agri-Science Learning Center with approximately 120 members attending. The MAFF Public Speaking Contest is designed to develop agricultural leadership, provide for member participation in agricultural public speaking activities, and stimulate interest in leadership and citizenship. Contestants may choose any current subject for their speeches, which is of an agricultural character relating to county fairs and which is of general interest to the public. 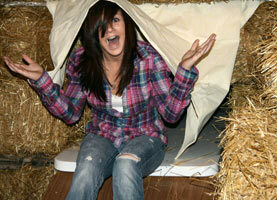 Cassie Reid represented the Livingston County 4-H and FFA Fair at this contest held January 29, 2010. Cassie placed 4th at this state competition. 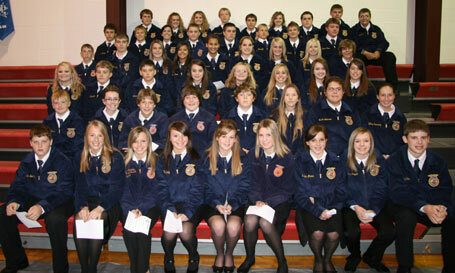 On Wednesday, January 6, 2010, sixty-three (63) Chillicothe FFA Freshman attended the Northwest District Greenhand Motivational Conference at the North Central Missouri College Campus in Trenton, Missouri. Click photo to see a closer view. Through interactive workshops and skits, Missouri State FFA Officers used the FFA version of the “Wizard of Oz” as the theme to motivate Greenhands, who are first year FFA members. They helped the new agriculture students set goals for their education, careers and FFA experiences. MFA Incorporated sponsored this event in coordination with NCMC. The Chillicothe FFA held their annual food drive this December. Students collected canned food items for the drive and compiled them at the December FFA Meeting, which was held December 4, 2009. The canned food items were then delivered to the local Salvation Army. The chapter collected ten boxes of food to donate to the Salvation Army. Seniors Kyle Ulmer, Austin Cassity, and Jacob Ballard delivered the food for the chapter. Jon Black represented the Livingston County Farm Bureau at the Missouri Farm Bureau Conference contest held December 6, 2009. Jon received second place at the state level, congratulations. 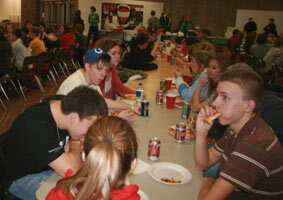 On December 4, 2009, the Chillicothe FFA held their annual Christmas Party at the Chillicothe Middle School. This party represents a reward for members on an excellent Barnwarming this year as well as a time for fellowship. The members enjoyed dinner and then moved into the field house for some games. Members played basketball, dodge ball, volleyball, and had other activities. The students also held a canned food drive and collected 11 boxes of canned food items. There were approximately 165 members present and everyone seemed to enjoy the evening. 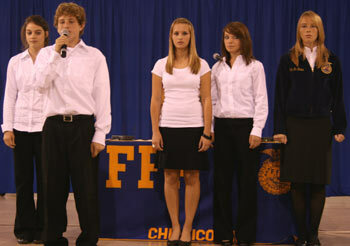 On November 4, 2009, Chillicothe FFA students participated in the Area 2 Fall Speaking Contest in Gallatin. Jon Black competed in the Missouri Farm Bureau Contest, Lauren Dietzschold competed in the Missouri Pork Producers Contest, Kellin Ferguson competed in the Missouri Institute of Cooperatives Contest, Carrie Boon competed in the Missouri Sheep Producers Contest, Ashley Myers competed in the Missouri Soil and Water, and Amber Kieffer competed in the Missouri Young Farmers speech contest. All six members qualified to move on to the district competition. At the Northwest District competition, held on November 18, 2009 in Cameron; Jon Black received first in the Missouri Farm Bureau Contest, Kellin Ferguson received first in the Missouri Institute of Cooperatives Contest, Lauren Dietzschold received first in the Missouri Pork Producers Contest, Carrie Boon received third in the Missouri Sheep Producers competition, Ashley Myers received second in the Missouri Soil and Water competition, and Amber Kieffer received first in the Missouri Young Farmers contest. Jon, Kellin, Amber, and Lauren will move on to the state competition later this year. 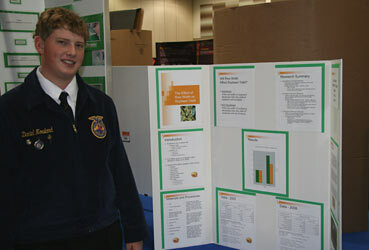 INDIANAPOLIS - Daniel Nowland of Chillicothe, MO recently competed in the National FFA Agriscience Fair. Daniel Nowland was awarded with a Bronze medal in honor for the project titled: The Effect of Row Width on Soybean Yield. Daniel’s abstract to his Agriscience project is as follows: Soybeans make up 90% of US oilseed production. Most soybeans are crushed into soybean meal and soybean oil. Factors that affect soybean yield include weather, crop rotation, soil fertility, seed variety, seedbed preparation, planting date, planting depth and row width. In past years, most soybeans were planted in rows spaced 30 inches apart. Soybeans can also be planted in 15 inch rows and drilled in 7.5 inch rows. The researcher wanted to see if 15 inch rows would yield more than 30 inch rows. The hypothesis stated that if the row width of soybeans decreases then the yield of soybeans will increase. The researcher tilled a 15’ by 30’ plot for use with this research. Seven 15 inch and four 30 inch were planted. The seeds were planted every 3 inches for the 15 inch rows and 1.5 inches for the 30 inch rows. This enabled the same seeding rate/acre for both plots. Merschman Kennedy 5388RR seed was planted in 2007 and Pinoneer 93M11 in 2008. The planting dates were May 26, 2007 and June 2, 2008. The harvest dates were October 2, 2007 and November 2, 2008. The independent variable was width of rows, 30 inch and 15 inch rows. The dependent variable was yield of soybeans per acre. Four rows of 30 inch and 7 rows of 15 inch soybeans were planted. The researcher harvested two rows of the 30 inch plot and five rows of the 15 inch plots were harvested. The outside rows of each plot were not harvested because they got more light, more water, and more room to grow. The row width and plot area were decided by repeating an experiment done at the Hundley-Whaley Center, University of Missouri. In 2007 the 30 inch rows yielded 25.50 bushels/acre and the 15 inch rows 25.24 bushels/acre. In 2008 the 30 inch rows yielded 57.10 bushels/acre and the 15 inch rows 40.39 bushels/acre. In both years, the 30 inch rows had a larger yield than the 15 inch rows. The hypothesis was wrong and not accepted and the null hypothesis is accepted. Daniel Nowland was successful at the state level before moving onto the National Fair. Participants received ribbons along with their medals and were honored at a banquet at the National FFA Convention, October 21-24, in Indianapolis, IN. 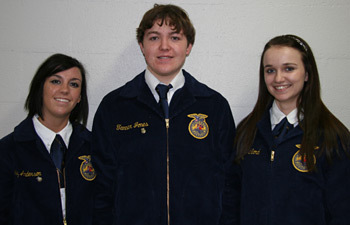 Kellin Ferguson of Chillicothe, MO also recently competed in the National FFA Agriscience Fair. Kellin Ferguson was awarded with a Silver medal in honor for the project titled: Corn Meter Modification on Corn Singulation. 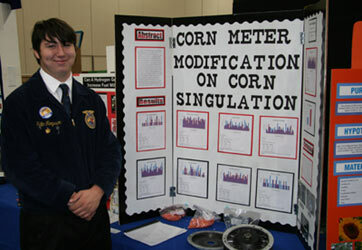 Kellin’s abstract to his Agriscience project is as follows: In the Corn Belt, which includes the states of Illinois, Indiana, Iowa, Minnesota, and Missouri farmers for many years have had problems with corn singulation. Corn singulation is the measure of how accurately a corn meter plants a seed, one at a time, in a predetermined length. The main problems that occur in singulation error are skips and multiples. Each of these problems causes a loss of the corn plant resulting in a loss of yield and capital. For each percentage error in corn singulation, six bushels of corn are lost. At today’s prices, this would result in a loss of $21 per acre. The average American corn farmer plants 1,000 acres of corn, which totals his loss at $21,000 for that one percent error. In this project, a corn meter was modified by grinding an extra set indents, or seed bumps, imbedded in the meter plate to potentially increase singulation accuracy. The modified meter was tested against a regular corn meter with a Meter Max machine. The meters were tested with multiple types of seeds and the results proved to be statically significant in most of the tests as skips and multiples were recorded. The data supports the theory that, the modified meter can help farmers increase both yield and profit, while decreasing corn singulation error. Kellin Ferguson was successful at the state level before moving onto the National Fair. Participants received ribbons along with their medals and were honored at a banquet at the National FFA Convention, October 21-24, in Indianapolis, IN. The agriscience fair program is sponsored by Ford Motor Company Fund and Syngenta as a special project of the National FFA Foundation, which includes cash awards. FFA is a national youth organization of 506,199 student members preparing for leadership and careers in the science, business and technology of agriculture with 7,429 local chapters in all 50 states, Puerto Rico and the Virgin Islands. FFA strives to make a positive difference in the lives of students by developing their potential for premier leadership, personal growth and career success through agricultural education. Visit www.ffa.org for more information. On October 21 through the 24, 14 members of the Chillicothe FFA Chapter attended the National FFA Convention in Indianapolis, IN. The students attended many activities while in Indianapolis. The students attended leadership sessions, the career show, college fair, and convention session while at the convention hall. Students also attended a session were the speaker was Mike Rowe from the TV show Dirty Jobs, a concert featuring Toby Keith, and got an opportunity to visit the National FFA Center. Local members that attended the convention were Daniel Nowland, Austin Cassity, Marlois Mason, Kellin Ferguson, Austin Ireland, Trent Putnam, Carrie Boon, Maycee Hoover, Maresa Sykes, Kyle Ulmer, Kendra Ballantyne, Shelby Hargrave, Michaela Simmer, and Emmy Venner. The National FFA Organization recently selected from a pool of more than 600 candidates nationwide the CHILLICOTHE FFA CHAPTER as a 2-star winner in the National FFA Chapter Award program. The chapter attended the 82nd National FFA Convention in Indianapolis, Indiana, October 21-24, 2009 to accept this award. Almost any event becomes more intriguing when viewed from behind the scenes. The 82nd National FFA Convention, which includes everything from arena stage events to the Day of Service and workshops for nearly 50,000 attendees, is no exception. It takes many volunteers to help make a convention of this magnitude a positive experience for all of its guests. This year approximately 900 FFA members, including students from the Chillicothe FFA Chapter, formed the National FFA Courtesy Corps. The students viewed the convention from the other side – backstage – playing a crucial role in the events logistics. Local members participating in the National FFA Courtesy Corps were Daniel Nowland, Austin Cassity, Marlois Mason, Kellin Ferguson, Austin Ireland, Trent Putnam, Carrie Boon, Maycee Hoover, Maresa Sykes, Kyle Ulmer, Kendra Ballantyne, Shelby Hargrave, Michaela Simmer, and Emmy Venner. The 82nd National FFA Convention was held October 21-24, 2009 in Indianapolis, IN. INDIANAPOLIS— Jaryn Black (daughter of Rusty and Karie Black), Jaime Cunningham (daughter of Wayne and Dee Cunningham, Katie Eggers (daughter of Brian and Tena Eggers, and Morgan Quinn (Raymond and Robin Quinn) received the American FFA Degree at the 82nd National FFA Convention in Indianapolis on Saturday, October 24, 2009. It is the highest degree awarded by the National FFA Organization and recognizes Jaryn, Jaime, Katie, and Morgan demonstrated leadership abilities and outstanding achievements in agricultural business, production, processing and service programs. Less than one in 154 FFA members advance through their local chapter and state FFA degree programs to earn this national degree. They received a gold American FFA Degree key and a certificate in a blue leatherette frame to commemorate the achievement. The recognition program is sponsored by Case IH, Farm Credit, Pioneer Hi-Bred, a DuPont Company and Syngenta, as a special project of the National FFA Foundation. The national FFA convention is the nation’s largest annual youth gathering, welcoming students, parents and educators from all across the United States. 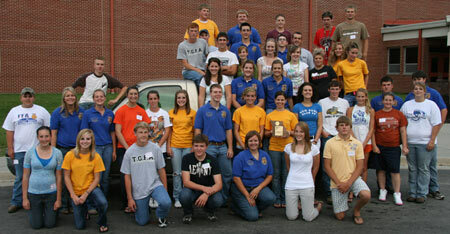 The National FFA Organization, formerly known as the Future Farmers of America, is a national youth organization of 507,763 student members – all preparing for leadership and careers in the science, business and technology of agriculture – as part of 7,439 local FFA chapters in all 50 states, Puerto Rico and the Virgin Islands. The National FFA Organization changed to its present name in 1988, in recognition of the growth and diversity of agriculture and agricultural education. The FFA mission is to make a positive difference in the lives of students by developing their potential for premier leadership, personal growth and career success through agricultural education. Visit www.ffa.org for more information. The Chillicothe FFA Chapter was represented in Columbia by Kristi Barton, Cara Boydstrum, Maddie Boyles, Brooke McCully, Blake Rasmussen, and Trey VanHouton. These students were given a program put on by Leigh Britt and the Columbia Master Gardners, then took a tour of the Mizzou Campus, and participated in 2 hours of community service according to the standards set by the National FFA. Mizzou FFA worked with Leigh Britt, Community Service Director for the City of Columbia to identify and excite two different projects: clearing Honeysuckle from Stephens Park and landscaping an intersection divider at Broadway and Old 63 in West Columbia. Following the community service project, participating chapters attended an awards and recognition banquet to recognize local community projects. On October 14, 2009, 53 Greenhands of the Chillicothe FFA Chapter attended the Area II Greenhand Initiation Ceremony in Gallatin, Missouri. The Area II officer team, lead by President, Jon Black of the Chillicothe FFA Chapter conducted the initiation. During the initiation, the Greenhands listened to the 2009 Area Creed speaker recite the creed, watched a slideshow featuring Area II Greenhands, listened to the Missouri FFA State Officer from Area II, Meredith Jones, speak and were presented their Greenhand pins during the Greenhand Ceremony. 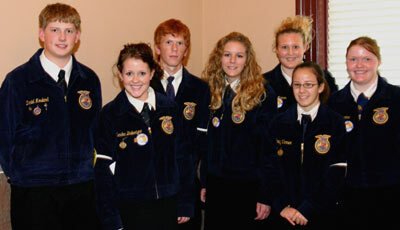 During the week of October 5-9, 2009, Chillicothe FFA members had the opportunity to participate in the Local Fall Speaking Contests. The participants and winner in the following contests are: Missouri Farm Bureau – Jon Black (winner), John Davis, Aaron Kerr, Chelsea Mann; Missouri Institute of Cooperatives – Caitlin Cramer, Kellin Ferguson (winner); Missouri Pork Producers – Maddie Boyles, Lauren Dietzschold (winner), Marc Griffith, Daniel Nowland, Sydney Oden, Maresa Sykes; Missouri Young Farmers and Young Farm Wives – Amber Kieffer (winner); Missouri Fairs and Festivals – Quincy BeVelle, Dani Moore, Brooklyn Reed, Cassie Reid (winner), Michaela Simmer, Alexis Sykes; Missouri Soil and Water Conservation – Travis Henry, Hannah Meyers, Ashley Myers, Emily Sallee (winner), Brooke Westcott; and Missouri Sheep Producers – Carrie Boon (winner), Maycee Hoover, Marshelle Johnston, Kayla McCullough, Emmy Venner, Jennifer Waits. The students were required to write a 6-8 minute speech on their given topic. The winners will move on to area competition on November 4, 2009. Another Successful Chillicothe FFA Barnwarming! 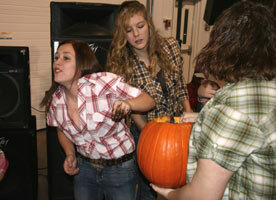 On Saturday October 31, 2009 the Chillicothe FFA held its annual Barnwarming festivities. These festivities included a dance, games, a hay tunnel, and the coronation ceremony. This year’s 2009 Barnwarming King and Queen are Clayton Allen and Baillie Schnieders. The Seniors Class, candidates – Baillie Schnieders (daughter of Frank Schnieders and Jerry & Diana Havens) and Clayton Allen (son of Jill Allen and the late James Allen) raised $8,191.50 with an average of $234.04 per person; Juniors, Konner Ferguson (daughter of Rick and Patricia Paris and Steve Ferguson) and John Davis (son of Bret and Darla Davis) raised $5,744.00 with and average of $185.29/person; Sophomores, Michaela Johnston (daughter of Billy and Nancy Johnston ) and Nick Koenig (son of Mike and Lisa Koenig) raised $3,873.00 with and average of $54.55/person; Freshmen, Bridgett Kieffer (daughter of Jason and Kim Kieffer) and Josey Riddle (son of Jason and Mary Jo Riddle) raised $3,857.00 with and average of $49.45/person. The chapter raised $21,665.50 this year for the chapters operations that average out to $100.76/member. getting a Carmel apple or Carmel onion; Sophomore girls reaching in a pumpkin full of worms to get a game piece. We would like to thank all the member of the community for the long time support of our organization. It's Chillicothe FFA Barnwarming Time Again! 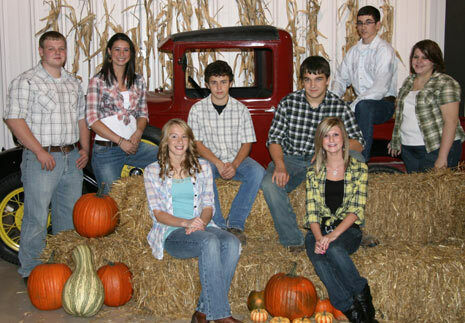 The Chillicothe FFA has selected its King and Queen Candidates for the 2009 Barnwarming. These individuals will lead the charge in the fundraising efforts of the Chillicothe FFA members. The FFA members are now available to do your odd jobs around the house and farm. Give them a call and they will organize a work team to help you in your fall cleanup activities. 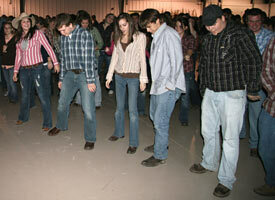 The class that averages the most money per member will have their candidates crowned King and Queen on October 31, 2009 at the annual Barnwarming Dance. The truck is a 1930 Model A Truck owned by Vern and Jean Allen. Sophomores, Marshelle Johnston (daughter of Billy and Nancy Johnston) and Nick Koenig (son of Mike and Lisa Koenig); Freshmen, Bridgett Kieffer (daughter of Jason and Kim Kieffer) and Josey Riddle (son of Jason and Mary Jo Riddle). The chapter has set a goal to raise $18,000 this year for chapter operations. If you have any type of job please give an FFA member a call or call one of the advisors at the Grand River Technical School at 646-3414. 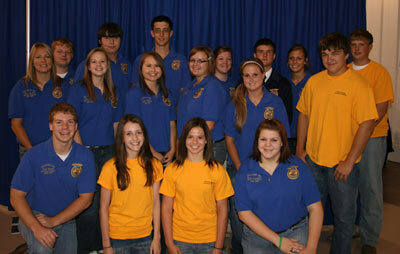 On September 16, 2009, the Chillicothe FFA held their annual Parents’ Night, where 335 members and guests attended. This event is to help welcome the first year FFA member and their parents’ to our organization, as well as showcase some of our members’ talents. The evening began with FFA opening ceremonies followed by a welcome given by Dr. Linda Gray Smith, Chillicothe R-II Schools Superintendent. The Chillicothe FFA Chapter officers, Chillicothe FFA Assistant Officers, and Bosworth Assistant Officers presented the program. The program consisted of the Greenhand FFA degree ceremony, Chapter FFA degree ceremony, skit presented by the Chillicothe FFA Chapter Officers, as well as 2 creeds presented by Greenhands. The Chillicothe FFA Chapter has had a long tradition of participating at the Missouri State Fair. 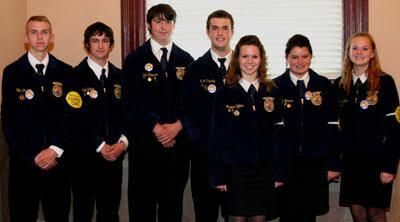 This year, the Chillicothe FFA was honored for their participation with the Governor’s Award. This award is given to the chapter which has the most points exhibiting livestock during the Missouri State Fair. Points are given according to exhibitors placing (gold, silver, bronze), number of exhibits, and number of exhibitors. The Chillicothe FFA received 2nd place in the Goat Sweepstakes, 2nd place in the Swine Sweepstakes, 2nd place in the Poultry Sweepstakes, and 10th place in the Beef Sweepstakes. 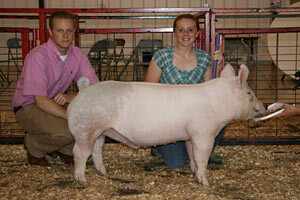 The Chillicothe FFA had 109 entries that were exhibited by 40 exhibitors. In the past 10 years Chillicothe FFA has received is award 6 times. 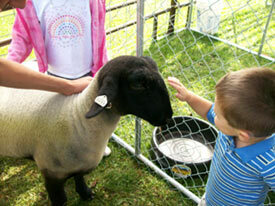 This year marks the 8th year that the Chillicothe FFA is sponsoring the petting zoo at Chautauqua in the Park. Our chapter wants to take this opportunity to share more information about agriculture. The petting zoo is always great, this year we will have a larger variety of animals, such as goats, rabbits, sheep, pigs, kittens, puppies, rats, poultry, bottle calf, and a miniature horse. To improve the petting zoo and share more information, there will be a fact finding scavenger hunt for the children. The participating kids will get a question sheet and look for posted Ag Facts around the park. When they are finished they can bring their answers back to the petting zoo and they will receive a prize donated by some of the agriculture commodity groups around the state. We look forward to seeing all the children participate. Don’t be shy, get involved with Go 4 Ag. On July 28-29, 2009, the Chillicothe FFA Officer teams had their annual officer retreat, this year at Long Branch Lake in Macon, MO. The retreat focused on activities planning, communication skills, teamwork, and leadership. The officer teams set goals, planned activities for the chapter, worked on team building skills, and had a little fun. When the work was over the officers enjoyed boating on the lake, learning how to water-ski and tube. Front (left to right) - Tyler Skipper, Haley Thompson, Maresa Sykes, Baillie Schnieders. On Monday, August 3, 2009 the Missouri Area II Officers held a workshop for chapter officers at the Mervin Jenkins Building at the Livingston County Fair Grounds. The workshop focused on communication skills, teamwork, and leadership. The workshop consisted of the Area II Officers conducting opening ceremonies then area chapters competed in both a rituals contest and a best-dressed contest. 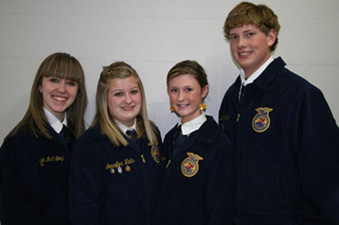 The rituals contest is to see which officer team can present the official FFA opening ceremonies with the fewest flaws. The best-dressed contest is to see with chapter officer team was dress the best as a team. Results of the competitions: Rituals – 1st place Chillicothe, 2nd place Jamesport, 3rd place Trenton, Creative Dress – 1st place Polo, 2nd place Jamesport, Best Dressed – 1st place Chillicothe, 2nd place Gallatin. The workshop session covered the topics of communication, fundraising, teamwork and leadership. The Area II officers planned and conducted the event. Chillicothe FFA members gather around a truck donated by Barnes Baker Motors for the FFA chapter to use this summer. The FFA members expressed their appreciation to Barnes Baker for the use of the truck. Members are also holding plaques of various awards individual members and the entire chapter received over the summer. Livingston County 4-H received 3rd place in the Swine Sweepstakes. The Chillicothe FFA Chapter received was the Swine Herdsmanship, 2nd in the Swine Sweepstakes, 2nd in the Poultry Sweepstakes, 2nd in the Goat Sweepstakes, 10th in the Beef Sweepstakes and the Best (1st) FFA Livestock Exhibit (for the second year in a row) Award during the 2009 Missouri State Fair. CAPTION: Left to right: Meredith Jones, Area 2 State Vice President, Nick Koeing, Dani Moore, Daniel Nowland, Hope Peters, Lauren Dietzschold, Maresa Sykes, Amber Kieffer, Catlin Cramer, Carrie Boon, and Shari Brunner, Area 4 State Vice President. Members from the Chillicothe FFA Chapter recently attended the Missouri FFA Association’s Leadership Adventure in Columbia. It was held July 30 in the Memorial Union at the University of Missouri. Agricultural careers, leadership development, and positive role models were the focus of this 20th annual conference. The University of Missouri was one of two locations for this conference; the other was Springfield. Over 200 members and advisors registered for the two conferences from 47 chapters across Missouri. Over 5,000 Missouri FFA members have attended The Leadership Adventure since its beginning in 1990. The leadership training was headed by Andrew McCrea, former state and national officer from Missouri and Corey Flournoy, former state and national officer from Illinois. Current State FFA Officers from Missouri assisted in the leadership training sessions this year, which were conducted for two groups: (1) High School Freshmen and Sophomores exploring development of their leadership potential, and (2) Junior and Senior students seeking to maximize their leadership skills. Attending the conference from the local FFA chapter were: Nick Koeing, Dani Moore, Daniel Nowland, Hope Peters, Lauren Dietzschold, Maresa Sykes, Amber Kieffer, Catlin Cramer, and Carrie Boon. Over 1100 FFA members from 110 Missouri High Schools had the opportunity to learn how to become effective leaders at the 65th annual Missouri FFA State Leadership Camp. Starting in the summer of 1945, the Missouri FFA Association has sponsored this weeklong experience for FFA members at the Lake Ozark State Park, Kaiser, MO. This year’s six weekly camping sessions were held between June 1st and July 10th. Twenty-nine Students from the Chillicothe FFA Chapter attended camp from June 29 to July 3. Some students that received awards at camp are Caitlin Cramer – 2nd place Creed Speaking, Michaela Simmer – 3rd place Creed speaking, Caitlin Cramer – 3rd place Extemporaneous Speaking, Cassie Reid – 3rd place FFA Knowledge, Clayton Allen & Nick Koenig – 1st place Horse Shoe Doubles, Cassie Reid – All Around Camper, and Leadership Medals went to Marc Griffith, Caitlin Cramer, Cassie Reid, Michaela Simmer, and Haley Thompson. Through interactive workshops, the camp’s Leadership Director, Jordan Branstetter, along with several Missouri Ag Industry Professionals and the State FFA Officers used “You Decide 2009” as the theme to motivate the FFA members. They helped the agriculture students from throughout the state to identify ways to make positive choices, establish personal and career goals, and identify the traits necessary to become an effective leader in their school and community. The FFA is a national youth organization of over 500,000 student members preparing for leadership and careers in the science, business and technology of agriculture with 311 chapters and more than 24,000 members in Missouri. The FFA strives to make a positive difference in the lives of students by developing their potential for premier leadership, personal growth and career success through agricultural education. 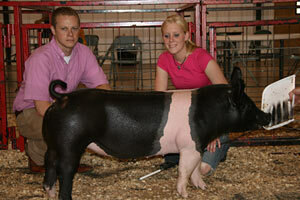 On June 13 and June 14, 2009 the Livingston County 4-H & FFA Fairgrounds-Jenkins Expo Building hosted three swine shows. There was approximately 430 head of hogs shown at this weekend’s event. On Saturday morning the show was sponsored by the Missouri Swine Youth Supports there was approximately 220 head of hogs at this show. The results of the show were Supreme Gilt went to Carter Ward, Reserve Supreme Gilt went to Mitchell Sutter, Supreme Barrow went to Tyler Hogg, and Reserve Supreme Barrow went to Lance Martin. The Saturday night show was the Missouri Elite Breed Spectacular, this show was sponsored by Certified Pedigree Swine, Chillicothe State Bank, Davis Livestock, Davis Spot Farm, J.R. Reid Show Pigs, Whitehead Spots, Travel Tyme/Pap’s Primitive, Oram Family Spot, Diamond J Livestock, Gail and Garett Reid Families, Randy Derr, Stein and Stewart Genetics, Perry Purebreds, Robinson Genetics, and National Swine Registry. The results are Champion Berkshire Gilt went to Taylor McGaugh, Reserve Champion Berkshire Gilt went to Austin Boland, Champion Chester Gilt went to Jamie Cunningham, Reserve Champion Chester Gilt went to Dallas Kleiboeker, Champion Duroc Gilt went to Quincy BeVelle, Reserve Champion Duroc Gilt went to Dylan Bishop, Champion Hampshire Gilt went to Cater Ward, Reserve Champion Hampshire Gilt went to Cooper Sutter, Champion Poland Gilt went to Brent Boland, Reserve Champion Poland Gilt went to Lawton Johnson, Champion Spot Gilt went to Quinten Lewis, Reserve Spot Gilt went to Kaylee Lewis, Champion Yorkshire Gilt went to Brad Storck, Reserve Champion Yorkshire Gilt went to Abby Gass, Champion Berkshire Barrow went to Blaire Todd, Reserve Champion Berkshire Barrow went to Lawton Johnson, Champion Chester Barrow went to Lance Martin, Reserve Champion Chester Barrow went to Noah Gamm, Champion Duroc Barrow went to Lance Martin, Reserve Champion Duroc Barrow went to Emily Blaue, Champion Hampshire Barrow went to Rachel Thorton, Reserve Champion Hampshire Barrow went to Shelby Sutter, Champion Poland Barrow went to Jamie Switlik, Reserve Champion Poland Barrow went to Harley Wooldridge, Champion Spot Barrow went to Johnny Johnson, Reserve Spot Barrow went to Austin Boland, Champion Yorkshire Barrow went to Layne Robinson, and Reserve Champion Yorkshire Barrow went to Tyler Hogg. The Junior Showmanship went to Aubrey Burns, Intermediate Showmanship went to Quinten Lewis, and Senior Showmanship went to Andrew White. Sunday morning the Chillicothe FFA Alumni hosted the North Central Missouri Show Pig Bonanza were there were approximately 200 head of hogs. The sponsors of this show were Ag Venture, American Family-Janet McCauslin, Andy Parks, Bank Midwest, Barnes Baker Motors, Brammer Show Pigs, Brotherton Farms, BTC Bank, Chillicothe Animal Hospital, Chillicothe State Bank, Chula Farmers Coop, Citizens Bank & Trust, Croy Show Pigs, Cunningham Plumbing Co., Davis Livestock, Dean Machinery, FEC, Grand River Technical School, Hoffman-Reed Inc., Hutchinson & Co., J.R. Reid Show Pigs, Livingston TV & Appliance, Pioneer HiBred Seed, MFA Agri-Service, Roberts Law Office, Rudasill Farms LLC, Simms Show Pigs, T & R Soil Service, TLD Livestock, Trans Ova Genetics, Williams Farms, Wolf Farms, and Wolf Brothers. The results of this show are Supreme Champion Gilt went to Bailey Pope, Reserve Supreme Champion Gilt went to Layne Robinson, Supreme Champion Barrow went to Kati Viets, and Reserve Supreme Champion Barrow went to Bailey Pope. Showmanship results are Champion Junior Showmanship went to Olivia Loges, Reserve Junior Showmanship went to Lawton Johnson, Champion Intermediate Showmanship went to Kati Viets, Reserve Intermediate Showmanship went to Carter Ward, Champion Senior Showmanship went to Brad Storck, and Reserve Senior Showmanship went to Tyler Dietzschold.